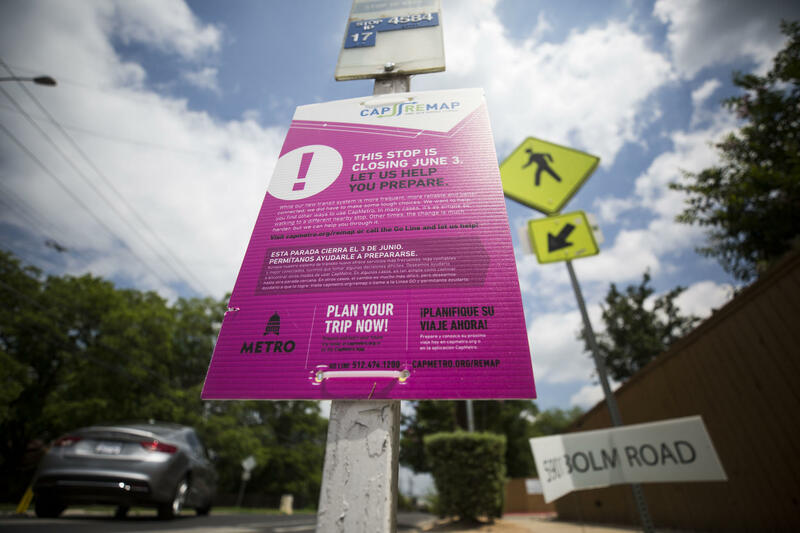 A bus stop on Bolm Road near Perry Street is getting eliminated under Capital Metro's Cap Remap. It’s been a few years since East Austin resident Bonnie Hauser sold her car. 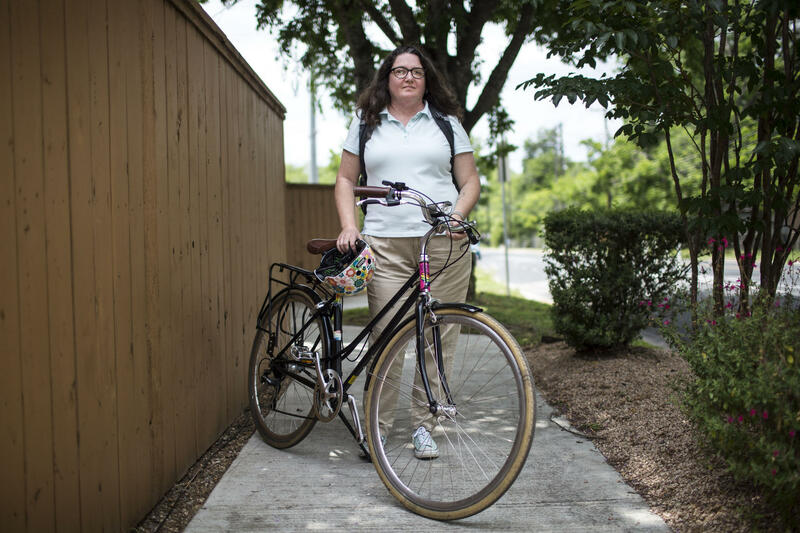 The librarian's commute is short enough that she usually bikes or walks to work with the Austin Independent School District. When she has a meeting downtown, Hauser takes the No. 17 bus from her neighborhood. 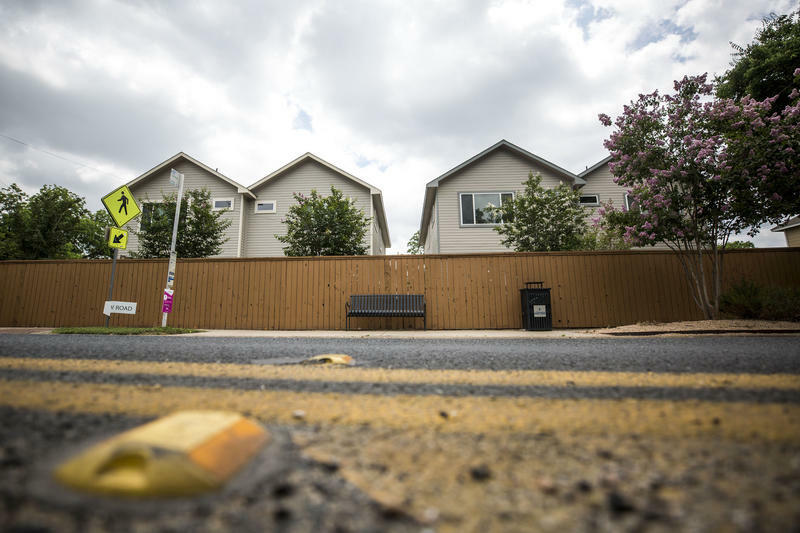 Bonnie Hauser, a librarian with the Austin Independent School District, says Capital Metro's new bus routes will eliminate her East Austin neighborhood entirely. 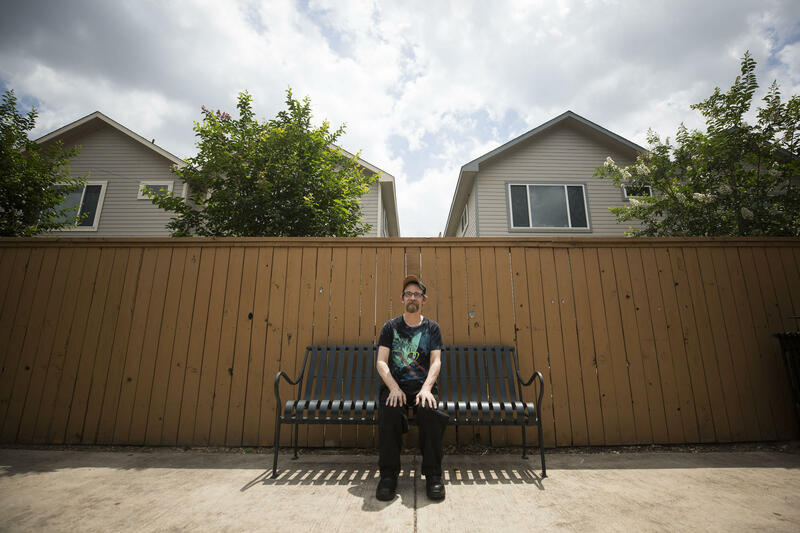 “Right now, I have a five-minute walk from my house to this bus stop,” Hauser said, standing at a stop on Bolm Road. But major changes are on the way for the region’s public transit system. Capital Metro says the plan known as Cap Remap, which launches June 3, will simplify the bus system while adding more frequent routes. But for Hauser and some of her neighbors, it will mean walking about half a mile to a stop at Airport Boulevard and Shady Lane and then making a transfer before getting downtown, about four miles away. One of the goals of Cap Remap is to route more buses onto major corridors and keep them from winding through small neighborhood streets. Hauser’s usual bus will be moved off Bolm and largely onto Cesar Chavez. Hauser has been trying to do just that. Hauser’s neighbor, Jason Wright, works at a restaurant downtown and the bus is his main source of transportation. Wright said the changes will make his commute longer and that he’s reached out to Cap Metro five or six times to voice his disapproval. Jason Wright, who takes the bus to work downtown, said he's complained to Cap Metro several times about the new routes. 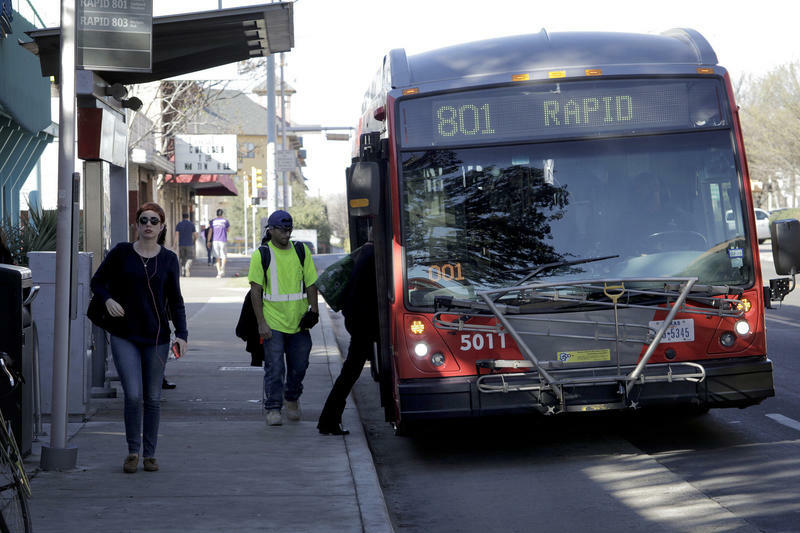 At a media roundtable last week, Cap Metro CEO Randy Clarke said these are the biggest changes ever made to the region’s bus system, affecting more than half of all routes. Cap Remap will bring 14 high-frequency routes to the system. They’ll run at least every 15 minutes, seven days a week. Bus rides will be free during the week of the rollout, and Cap Metro will have more than 900 staff members deployed to bus routes to help people get where they need to go. The transit agency has spent more than two years planning these changes and gathering community feedback. To provide more frequent and reliable service, Clarke said, Cap Metro had to make some tough decisions. Riders can see what their new routes will look like after June 3 through Cap Metro's trip planning tool. After learning about that feature, Wright said he feels a little more prepared to take on the changes. 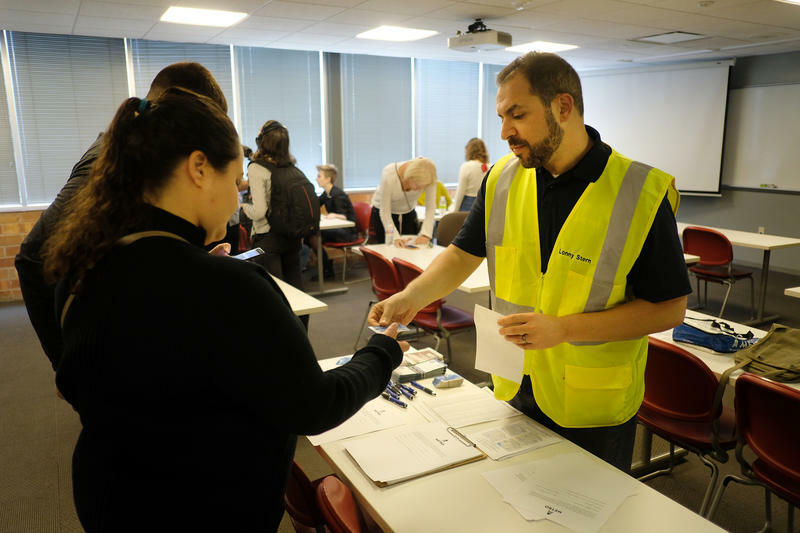 He said he understands the goal of having bus routes work together as a system, but major changes to individual routes can feel pretty personal for longtime riders. 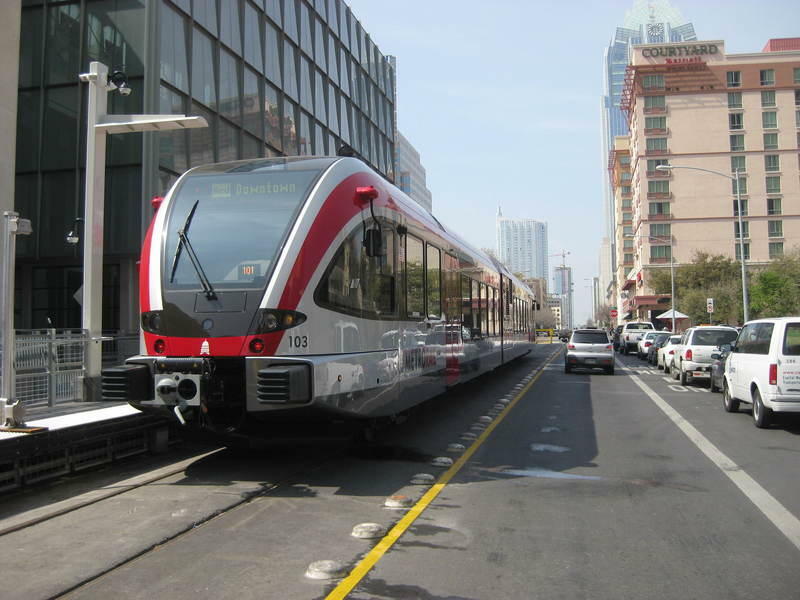 Is Austin Getting Another Shot At A Light-Rail Line? Austin is (again) flirting with the idea of a light-rail system, it seems. A tweet has given us a glimpse at Cap Metro’s plans to build out a light-rail system in Austin that would cost anywhere between $1.4 and $2.1 billion. The tweet appeared to show a Project Connect-branded outline of a route that would run along a 12-mile stretch, connecting Guadalupe Street and Lamar Boulevard north to Highway 183, with room for more lines. Capital Metro has revealed the latest designs for a new downtown MetroRail station. Updates include three new railway tracks and five new trains, which will accommodate more traffic than the current station’s single track and train.